This diagram will leave you with only a sliver of fabric left when you are done. 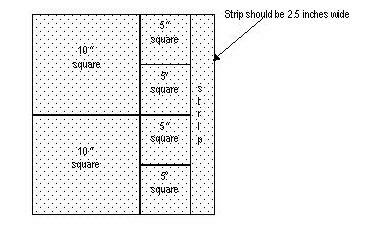 As most of you know, fat quarters are ¼ of a yard cut in half lengthwise and then crosswise. The fat quarter should be approximately 18” x 22”. You will find a downloadable copy of this here or in the Free Tools section under ■ Fat Quarters - How To Cut Up A Fat Quarter Into Popular Precut Sizes With No Waste (two layer cakes, four charm squares and one jelly roll slice. What a great idea! In my stash, I have a number of loner FQs, as I'm trying to dissolve my stash, this would be perfect!